This week, astronomers made two exciting discoveries: the first is a ring system surrounding an asteroid named Chariklo, which orbits in a region between Saturn and Uranus. This surprising finding makes Chariklo’s the fifth known ring system in our solar system , joining Jupiter, Uranus, Neptune and Saturn, and the first known to have formed around an asteroid. The second major find is a distant, icy dwarf planet in the far reaches of the solar system, 7.5 billion miles from the sun. The object, officially known as 2012 VP113, measures about 280 miles across. It’s extremely cold with a temperature of around minus 430 degrees Fahrenheit and is reported by astronomers to be faint and pink, making it hard to detect. 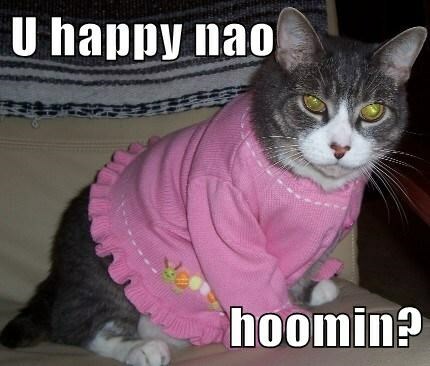 Our thanks to Kibbles kitteh and Mr. Boots for playing the roles of Chariklo and VP113 so graciously. 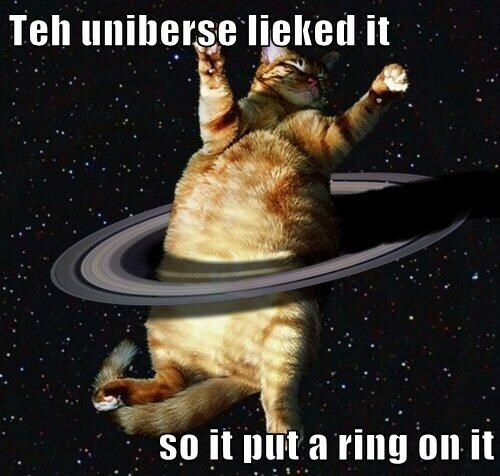 This entry was posted in Science Caturday and tagged Astronomy, astronomy cat, Chariklo, Dwarf Planet, Planet cat, Saturn cat, science cat. Bookmark the permalink.